haha all i'm saying is yesterday balester pitched well and didn't get a win, hopefully that doesn't happen to lannan today. and houston, you're entitled to your opinion. i've been using it for over a year now. But who really cares at this point unless you're all about individual stats. I thought you wanted a stud minor leaguer. Haha it's not his nickname, it's just a phrase I use for him when he's dealing like today. hahahaha spider, i still don't know why you think i'm in love with our minor leaguers? I'm the one who has been calling for a big bat through free agency/trades. Although Lannan has been shaky in his last few starts, he has had terrible run support throughout the year. Wow, blue hats. Trying to change the luck? he's been pretty awesome the last month and a half. Did you guy see that Cooley posted a picture of his johnson on his blog? It's covered up by the helmet now. Can't believe he supposedly did that on accident. Lannan seems well rested , following his last outing. Nice inning. Maybe he can go 1 more. I don't have a lot of those pictures lying around to inavdvertently post. And wouldn't do it anyway, even if I had a better zoom. Wonder if Boone will swing at the first pitch again. great at bat by dukes. sometimes he really does have good patience at the plate. YES!! Anderson is an RBI MACHINE!!! OT: How in the hell does TO still beat two defenders?! That crap's crazy. My guess is it's b/c there's more entertaining television on these days. Doesn't mean we've lost fans, though. He's a freak. Still one of the best in the game even though he's an idiot. This should be a high-scoring, entertaining shoot-out. I figured there would be more since we were playing the Mets and not the Marlins. Guess not. Tonight's game has been great so far. Fantastic pitching by our young starter and some clutch hitting. 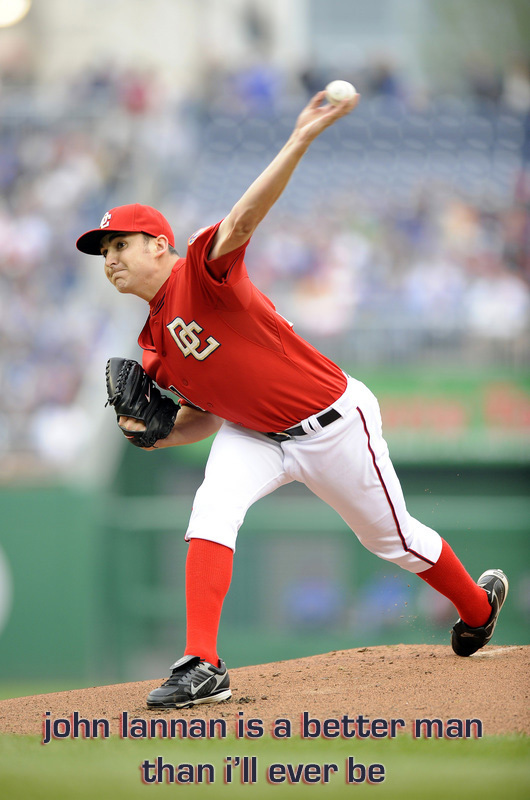 LET'S GIVE IT UP FOR JOHN LANNAN! 7 IP 1 H 1 R 1 ER 3 BB 7 K against the 1st Place Mets. That's quite an accomplishment.